Umm al-Jimal is part of the Tentative list of Jordan in order to qualify for inclusion in the World Heritage List. Umm el-Jimal are the ruins of Nabataean, Roman and early Byzantine town from the beginning of our era. It is located in one hour driving distance from one of the biggest Jordanian tourist attractions – Jerash. Although Syrian border is only 10 km away, access to the site is not limited or especially checked (which is the case of Umm Qays, another TWHS close to the Syrian border, where everybody has to be checked on the military checkpoint). 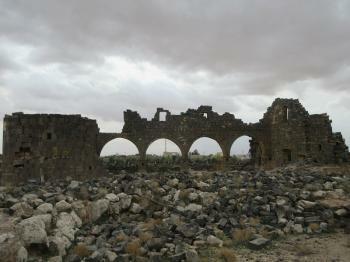 Although Jordan is famous from its ruined towns, Umm el-Jimal is probably the biggest of them. It is really huge and if you want to see all of it, reserve at least two or three hours. It is literally the sea of ruins of former streets, houses and churches. Some of the buildings remained less destroyed and now attract the biggest attention - one of the most impressive views is the lonely arch facade of former West Church. I suspect that Jordanian government wants to reconstruct some of the buildings before attempting inscription as a WHS (aimed for 2020), as I saw a crane on the site. Based on what I saw, Umm el-Jimal was an interesting site worth visiting. Comparing to already inscribed ruined town of Umm ar-Rasas, Umm el-Jimal is even more interesting (although without so impressive mosaics), so I would be happy to see the place as a WHS.